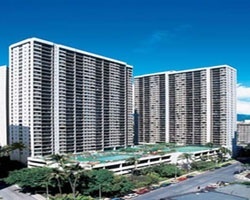 The *Hawaiian Sun Holidays at the Waikiki Banyan* condominiums are located in the Waikiki Banyan just a block and a half from the famous Waikiki Beach in downtown Honolulu, Hawaii! Honolulu is a thriving modern Capital city alive with cosmopolitan tastes of sophistication softened by a regal heritage and ancient Hawaiian ways. Around the island you will also find popular places such as Sea Life Park, Polynesian Cultural Center, Pearl Harbor Memorial, and more! *RCI Hospitality Awarded / Interval International Affiliated* Featuring a finely appointed 1 bedroom, 1 bath suite that will accommodate 4 guests comfortably. Usage is annual in a floating week. For more information or to make an offer, please submit the inquiry form.